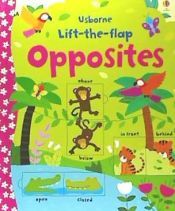 An interactive and engaging introduction to opposites that helps enrich youngsters' vocabulary. Ages: 3+. El autor de Lift-the-flap Opposites, con isbn 978-1-4095-8258-8, es Felicity Brooks, esta publicación tiene dieciséis páginas.